Dimensions 0.50 by 6.50 by 9.50 in. The Dispute Settlement Reports of the World Trade Organization (WTO) include Panel and Appellate Body reports, as well as arbitration awards, in disputes concerning the rights and obligations of WTO members under the provisions of the Marrakesh Agreement Establishing the World Trade Organization. These are the only authorized paginated reports in English. As such, they are an essential addition to the library of every practicing and academic trade lawyer, and will be widely consulted by students taking courses in international economic or trade law. The WTO-authorized printed DSR volumes commenced publication with DSR, 1996:I. Publication of the Cambridge printed edition follows the WTO website publication of all new reports, which will continue in the three working languages of English, French, and Spanish. Once a report has been released on the WTO website it will be published in the next Cambridge printed volume. 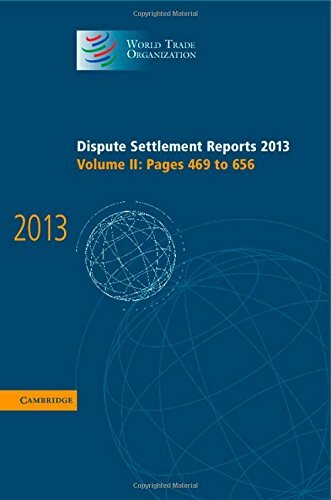 About: The Dispute Settlement Reports of the World Trade Organization (WTO) include Panel and Appellate Body reports, as well as arbitration awards, in disputes concerning the rights and obligations of WTO Members under the provisions of the Marrakesh Agreement Establishing the World Trade Organization.